The standard inverters of the Movitrac® LTP-B series are optimally matched to meet the requirements outside a control cabinet and are thus designed in degree of protection IP55 as standard. They have been developed for open-loop speed control of asynchronous and synchronous motors without encoder and are particularly economical in conveyor applications, hoists, as well as in fans and pumps. 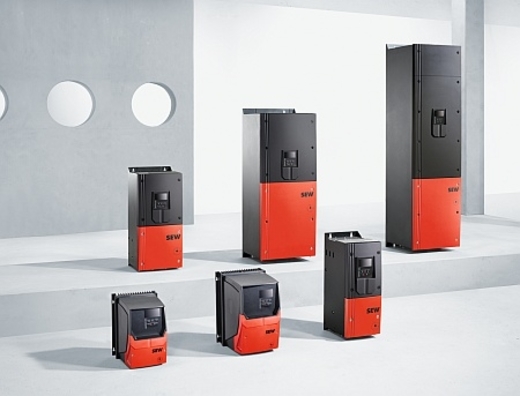 Movitrac® LTP-B in degree of protection IP55 come in 6 sizes with a power rating from 0,75 to 160 kW optimally suited for use in a dusty and humid environment. They are space-saving and can easily be mounted to a wall. As an alternative, inverters for installation in the control cabinet in the power range from 0,75 to 15 kW are available in degree of protection IP20. Movitrac® LTP-B standard inverters convince by their optimized scope of functions and their innovative housing technology. The compact design and universal use make for quick and easy integration into a multitude of applications, be it with asynchronous motors or synchronous motors, with or without encoder. Wide range of accessories: Cable sets, OLED full text display, etc. Process data exchange via fieldbus connection with Profibus DP, Profinet, Ethercat®, Ethernet/IPTM, DevicenetTM, CANopen, Modbus TCP or Modbus RTU directly in the inverter or optionally via DFx gateways.